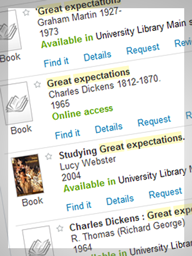 I recently ran a usability study for our new library discovery and delivery system. Despite being proprietary software, the system is reasonably customisable and we wanted to make sure that our implementation decisions were sound and the resulting site was as usable as possible. We invited a group of University students, academics and researchers and I observed them while they performed a series of scripted searches on the site. Sitting down with a user and watching them navigate a site is fascinating – you always discover something new. This time I was impressed by how sophisticated users’ online behaviour has grown. Looking back a mere 3 or 5 years to other evaluations I have done for similar products, it is clear that people are much more internet savvy than they used to be. They make very relevant comparisons with other sites and their expectations are so much higher. I also noticed that, although the overall online behaviour is much improved, users can approach the same task in very different ways… and they expect their method to work. If the site cannot accommodate their approach, then, well, it’s all but failed in meeting their needs. In fact, it seems that personalisation is a key requirement nowadays, particularly when it comes to large, complex sites like the one we were evaluating. Various users commented that they would like to be able to move filters to a different part of the page or close them down altogether to minimise information overload. Others wanted more information at a glance and greater ability to control what was presented to them. The only way to accommodate all these different preferences is by letting the user customise the interface according to their own needs. Working on the move, anywhere, anytime, is clearly another core expectation. Most participants got very excited when they saw the site was optimised for mobile access. Many asked if there was an accompanying app. As it happens, the plan is to integrate this search into the University’s mobile app and it’s very useful to know that there is an appetite for that. None of this will come as a surprise to anyone who’s been following advances on web development and user behaviour studies, but as someone who learns best from experience, I really appreciate having the opportunity to see with my own eyes. My overall conclusion is that the demands of these sophisticated users require a great degree of commitment to research and development. Clearly, we do not have the local resources to compete with the likes of Google or the latest web 2.0 startup. No, delivering to these requirements is now very much in the hands of library technology companies with the added pressure that library systems are not being evaluated just in comparison to one another, or even to other specialist applications like e-resource platforms. Web technology has well and truly crossed the boundary from work and study to all ambits of life, making these wider experiences an open field from where user expectation will continue to grow. Print article This entry was posted by Elena on 08/04/2012 at 5:27 PM, and is filed under User Experience. Follow any responses to this post through RSS 2.0. You can leave a response or trackback from your own site.